I get my drawing ability from my dad. When I was a kid he would draw pictures of Disney characters for my siblings and me and we would inundate him with requests. One day, I don't remember how old I was, I asked him to draw me a picture and he apparently didn't feel like doing it. So, he informed me in no uncertain terms that a drawing is only a series of lines that meet in the right places and that I could do it myself if I tried. Try I did. It wasn't long before my own versions of Mickey Mouse and Bugs Bunny were decorating the family refrigerator. As I got older, I began creating my own characters. I found that I had a natural talent for drawing and it was something I could do well. I did have significant problems drawing hands, which merely caused me to work harder to get them right. By the time I was in high school, I was the school newspaper cartoonist which continued into my junior college's newspaper. The natural extension of this was to attempt to develop my own comic strip and try to get it published in local newspapers. Unfortunately, as I discovered, the newspapers only publish comic strips that are syndicated and competition is tough. I soon put aside my professional cartooning aspirations and went to school to study graphic design, which I perceived as a more "marketable" profession, always keeping a sharpened pencil close by as a hobby. Years later, I was approached by Joe White, who had gotten my number from an acquaintance of an acquaintance, to design character models for an animated prime time television property he was developing. I accepted, and "The Corporate Sandbox" was born. Initially, he was the writer and I was the artist. However, with his input on the look of the character, and my obvious aspirations to write, it wasn't long before each of our roles within our creative relationship were not easily defined. It was while working on this first property that we formed the partnership of White & Carhart. We then developed two more animation properties, one based on a character I had created before and the other based loosely on a premise I had started to develop. All three properties are currently looking for a home in and out of Hollywood. Developing these properties for animation immediately held an appeal for me because I would not only be able to create characters, but I would contribute to the writing of the back story and story premises. Joe and I billed ourselves as writers who tell stories with both words and pictures. Although I have done some portraits in my youth and some straight illustration for clients, most of my artwork to this date has been in the realm of the cartoon. For some reason, I gain much more pleasure from doing a humorous drawing than I do from one that closely imitates life. Thus, Joe White and I have maintained our association and friendship over the years. "The Corporate Sandbox" and our second property, "Janet's Pet Peeve" have both been turned into single panel cartoon strips. Both strips have been published on the White/Carhart site until we opted to close the site down on November 1, 1998. Additionally, "Janet's Pet Peeve" has been published both in print (in Wichita, Kansas) and on the Internet at the Animation Nerd's Paradise which was associated with the Animation World Network. Joe and I had started development of a few other properties for animation and live action but we shelved them due to my move to Colorado. Even as a child, while creating and drawing my own cartoon characters, I was dabbling in graphic design without even knowing it. I used to create lettering for my characters, as if they were on TV and I was creating the opening titles. I know, strange musings for a kid who should be out playing cowboys and Indians with his friends. In retrospect, I realize that I was always fascinated with imagry. In my junior year of high school, I enrolled in Advertising Art, taught by Mr. Richard Williams, who also taught the school's Printing and Vocational Printing classes, which I also soon found myself enrolled in. By the time I was a senior in high school, I had a solid background in photographic typesetting; darkroom procedures; inking, running and cleaning offset presses; creating, printing and cleaning silk screens; as well as easily operating the folding machines and hydraulic paper cutter. On some days, I even taught the class. In order to spend more time in the print shop, I took Journalism as my English class in my senior year, in which my jobs basically consisted of being the school paper's cartoonist and printing the paper. I also had to write one article out of every four assignment periods which led to another venue of creativity...writing. One thing that I had that most of my high school classmates didn't was talent. I saw my newfound knowledge of printing as a means of furthering my artwork. A few years after I had graduated from high school, I did just that. I began producing a series of shirts based on one of my characters, selling them mainly to my co-workers at Douglas Aircraft where I worked for three years before getting laid off. It was then that I began studying graphic design full-time. I attended Platt College, Irvine (now Newport Beach), brushing up on my traditional design skills under the tutelage of Ms. Patti Denys as well as learning computer graphics on the Macintosh under both Ms. Lesley Ringer and Ms. Dianne Marlin. I found that I enjoyed being invovled with every aspect of design from the photography to the final mechanical, even the press checks. I knew I wanted to be more than a mere graphic designer. Two months into the program, I was freelance illustrating and designing. I graduated at the top of my class with a certificate for Outstanding Performance. The day after I graduated, they called me and asked me to teach the Saturday Workshops at the school. I accepted and continued to do it for another two years. I found that I could learn from other student's mistakes without actually having to make the mistakes myself and it gave me a valuable insight on how to work with others one on one. Even though I have moved to Colorado, I still maintain my association with Platt College to this day. Due to my extensive print background, and in additon to teaching the Saturday Workshops and freelancing, I was able to land a position as Art Director with Carol Wior, Inc., a mid-sized women's swimwear manufacturer who wanted to start their own art department from scratch. I saw this as a tremendous opportunity and wasted no time getting started. My job at Carol Wior, Inc. encompassed much more than the swimwear calendars, brochures and hang tags that needed to be produced in order to sell and represent each year's line of swimwear. Because Carol had never had an art department before, it was also my job to design the first in what would become an annual event for Carol Wior Inc... The Miami Mart showroom which would launch each year's line of swimwear to the buyers. Because I have always considered being a show designer for Walt Disney Imagineering as my dream job, I approached the challenge of designing a show room for Carol Wior, Inc. just as I would if I were designing an attraction at a Disney theme park. Working with Erich Ehrlich, Carol's National Sales Manager, I began learning the ins and outs of how the swimwear was presented so I had a good idea of what would be required...and how to surpass what was expected. We both agreed on a Beach theme. Since there are not any Polynesian islands around Los Angeles, I took a trip to Disneyland and took pictures of Adventureland, specifically the Tiki Room and Swiss Family Robinson attractions. I did conceptual sketches, designed signage, lighting and hanging racks. I devised thatched changing rooms for the models, designed and had a juice bar built and had the far wall on the room covered with a mural of a sunset. There was even a waterfall in the finished room, visible as the customers entered the room over the planked bridge. The island room was so successful, that a year later, I was commissioned to design a Hollywood Supper Club themed room at the same mart the following year. In addition to the themed signage that I created to go with my show designs, I have also been involved in other signage projects, most notably the work that I did for Dekra-Lite, a manufacturer of holiday street banners and lighting arrays. Unfortunately, Carol Wior, Inc. had no idea what a good Art Director was worth. Two and a half years later I moved on, mainly for monetary reasons. Before my resignation notice was up, I had landed another position designing for the Internet, something with which I had no previous experience. Leaving the office and security of my Art Director position at Carol Wior, Inc. was not easy to do but I knew it was time to move on. The opportunity to design for a whole new medium was more than enough to ease my worries and I dove in whole-heartedly, embracing the new technology at a time when designing for the Internet, the Web specifically, was all too new. Most Web designers at that time were technical minded and not versed in the creative process. They were not designers and had little or no mind for communication. I attained a design position with Internet Exchange International, Inc. (IEI) who actually had the correct notion that a web page should communicate a message to the viewer. Their largest client at the time was Toshiba America, Inc. and it wasn't long before I was working on the Toshiba America website. I adapted well to the digital medium. I liked that I could work at low resolution and that I had total control over the finished image without entrusting my work to a printer (browsers are, of course, another matter). I began experimenting in animation in Macromedia Director, authoring Shockwave spots and was at the forefront as the animated GIF emerged as the primary form of advetising on the Web. Eventually, I was promoted to Interactive Advertising Placement Director where I did more administration than design or animation. Luckily, for me, the company got a huge inflow of animation work, including PointCast spots for Toshiba America. My administrative duties were re-assigned to another and I was back on the creative team. I pioneered ways of reducing color depth in GIF images before mainstream software hit the marketplace and even authored a couple of papers on Internet creative which I have reproduced in the articles section of this site. I stayed with IEI for two years before leaving on good terms and starting Insignis, my own Internet Development company with my long time friend, Chris Weil. Since leaving IEI, I have done freelance and consulting work for them on two occasions. Whether you're writing fiction or an ad campaign, it all starts with the concept or the kernal of a story, even if it's not all revealed. Concepting can take it's form in many different ways. To me, it is coming up with the seed of an idea, a slant or POV from which the artist can approach a given subject and then how that is expanded and extrapolated. Unless I am creating a story, poetry or music, this almost always results in conceptual art: A picture that personifies the idea, getting a visual representation of the concept so that it no longer exists only in my mind. This is true of my collaberative efforts as well. As I brainstorm with others, I begin sketching things down so that it begins to take shape. Not only does this allow for alterations as all people involved view the project taking form, but it also ensures that everyone is on the same creative page. As the concepted project continues to expand and experts in other skill sets are brought in, revised and more detailed concept art is often called for to fill in the new comers on what the final project should be. While I was working at Internet Exchange International, Inc. (IEI), I had the good fortune of meeting an experienced and seasoned concept and ad writer by the name of Alex Kecskes. Alex immediately saw the merit in my work, seeking my visual input in his ad writing, and took me under his wing. We clicked immediately and IEI utilized our unique synergy, teaming us for two long-running Internet advertisment campaigns as well as a couple of web site designs. The main difference between Alex and I, besides age and experience, was that I was also an artist. My concepts usually expressed themselves in the form of concept art or a brief storyboard in order to get my message across to my superiors and the client. Being a team player, I would often re-draw Alex's storyboards as well, to better sell the concept. By the time Alex had moved on, I was an experienced ad writer in my own right, contributing useful concepts to every brainstorming and concept meeting and re-writing other's ads to better communicate the desired message to the targetted audience. Again, I had branched my creativity out into a new direction and again I found a sense of acomplishment in doing so. To me, a storyboard is merely an expansion of conceptual artwork, often used to bring to life the concept or idea behind a story-related project in a linear fashion...thus the term: Storyboard. 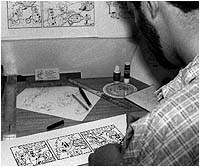 Pioneered by Walt Disney and his staff of animators in the thirties, storyboards are currently the standard used in giving visual life to film scripts (animation and some live action), TV animation scripts, commercials, CD-ROM games and even theme park attractions. A good storyboard will address every story and production issue that will eventually rear it's head, except perhaps budget. Dialogue, physical humor, character interaction, sound effects, score, camera angle, mood, lighting, composition and even character design to a certain extent will be explored as the story is visually expanded for all to see. The term for basically an evolved form of storyboard is called "animatics" which basically takes the properties of a storyboard and puts movement to it. George Lucas makes extensive use of animatics in the creation of his Star Wars films. Late in 1997, Joe White, my animation writing partner, informed me of an opportunity, in the form of an investor, who was willing to drop some money into the production of an animated short for one of our properties. We jumped at the chance. Joe wrote the basic script which we fine tuned together, adding some of my own contributions and rounding out the humor between the dialogue and the more physical slapstick. This provided me the opportunity to do something I had always wanted to do...storyboard an entire film, albiet a short one. The final film was available in the NTSC VHS format at the White/Carhart website until we closed the site down on November 1, 1998. My own drawings were roughly animated by a couple of students, but the writing still stands up and there is a 3D modeled version of our character in the cut scenes as well. I am generally quite proud of it and the storyboards from whence it came. In 1998, I was once again given the opportunity to design in the three dimensional realm. A client approached me with a project with which he needed help. For Holiday Headliners, I was commissioned to do the logo artwork as well as develop collectible plush character variations of an original design concept. These designs would be later made into patterns which would be cut and put together by a seamstress. Although I had never attempted such design work before, I was quite pleased with the results. After moving to Colorado, I obtained a job as Art Director for Galapagos Studios where I created top-selling T-shirt designs as well as managed freelance T-shirt artists. I created their art department from scratch and drove all of the company's national direct mail catalogs and their e-commerce website. It was an exciting position but I was offered a better one. Lucky for me, I had groomed my replacement well. Six years later, Matt Anderson still runs the art department at Galapagos. So my mind was at ease when I left Galapagos to work for LSCI Interactive (now 30 dps). I even continued my relationship with Galapagos by continuing to create T-shirt designs for them as well as re-design their website. Many of my T-shirt designs are still available and their current site is my design (although they update it now themselves). At LSCI, I produced animated Flash pieces and designed graphical interfaces for database-driven websites and CD-ROMs. I also edited sound, designed cartoon characters, concepted and produced ads, wrote multimedia scripts, art directed and produced four color print media. It was the sort of job I would have never left on my own. However, in the wake of the bursting of the tech bubble in 2000, things became difficult. Unfortunately, and against my wishes and the wishes of my boss, I had to move on. In mid-2001 I landed the job of Webmaster for Westone Laboratories, where I managed several websites as well as contributed significantly to the company's print image. Lori and I were married on August 2, 2003. On April 19, 2004 amidst some complications we welcomed Melody Hannah into the world (she was two months early). In mid-2004, my dad was diagnosed with a rare cancer in his jaw.Lori and I decided it would be best to put the house up for sale and return to California so we could spend time with him and the family. After surgery, radiation and chemo therapy, and several stints in the hospital, my dad finally excepted the Lord. He passed away the following day. We didn't make it. The house hadn't sold in time. So we came out for the funeral and we had to ask ourselves if we still wanted to move back to California. We decided that everyone dies and we'd like to spend the time we have left with family (my mom and Lori's parents are still very much alive plus we both have siblings). So in October 2005, I left Westone in Colorado and we returned to California where, after a few months freelancing, I accepted a fulltime position in the Interactive department at The Designory in downtown Long Beach where I made significant contributions to the Nissan Shift_2.0 campaign. Shortly thereafter, I was promoted to the head of Interactive Production where I managed three production artists and a handful of freelancers. I also have been given Art Director assignments on several Nissan projects. After a few years of doing that, I was moved to the Audi team where I contributed to multiple digital editions of Audi Magazine and worked on the digital Audi Library, first in it's Adobe DPS incarnation and then in it's proprietary content management incarnation, which won a gold ADDY. I was then moved back to the Nissan team in January 2018 to take what I had learned the previous year and apply it to Nissan's digital offerings. Also, starting in January 2018, I began The Creative Underground weekly-updated YouTube channel where I talk about and show behind-the-scenes for all of the different projects I'm working on from books to music to the revival of my 1992-era comic strip, "Elvin's Pet Peeve." Please go check it out and subscribe! Paul graduates from Millikan High School with the Medal of Merit in Industrial Arts (Printing) and the Medallion Award for additional credits earned for an ROP class in Graphic Design. Paul briefly attends Long Beach City College where he is a writer and cartoonist on the school newspaper. Paul begins drawing "Elvin's Pet Peeve" comic strips and comic book-style stories. He makes character T-shirts and sponsors a baseball team and submits the strip to syndicates for newspaper publication. After roughly 185 comic strips and several other stories and T-shirt designs, he abandons the strip to go to school for graphic design. Paul graduates from Platt College in Irvine, CA (the Orange County school has since moved to Newport Beach and then subsequently to Huntington Beach) with diplomas in Graphic Design and Computer Graphics and a certificate of Outstanding Performance. Paul is immediately asked to teach the school's Saturday Workshops. Paul takes his first full-time design job for Carol Wior, Inc. and is quickly promoted to Art Director. Paul takes a position with Internet Exchange to design for this new thing called the Internet... his first website design was for Toshiba America. Paul moves to Colorado Springs, Colorado and accepts an Art Director position with Galapagos Studios. Paul takes a position with multimedia and web design agency, LSCI Interactive (now 30dps) adding Flash animation, script writing and CD-ROM production to his experience and wins three awards. Paul accepts the position of Webmaster working in the Creative Services department of Westone Laboratories, Inc. The first episode of The Creative Underground UCCS web radio show is broadcast around the world with Paul Carhart as host. His first guest is author friend Jonathan Martin. The show will continue for six months before going on indefinate hiatus. It will ultimately be revived twice (2014 and 2018), both in Long Beach, California. Paul and family return to California. After freelancing for two months, Paul takes a job at in the Interactive department at The Designory in Long Beach, CA. Paul is promoted to head of Interactive Production for Nissan's website at The Designory and serves as Art Director on many Nissan projects. Paul leads Audi digital projects for The Designory through a nearly-impossible series of deadlines, utilizing the newly-built proprietary content management system, ultimately saving the digital business account for another year. Paul moves back to The Designory's Nissan team to share what he learned on the Audi account the previous year in regards to the proprietary content management system and to help lead the team through similar hoops for the Nissan digital projects. Paul also revives The Creative Underground (which started as an internet radio show in Colorado and then became a public access and YouTube show in 2014) as a weekly-updated YouTube show. Check it out, subscribe and share with your friends! Paul begins posting "Elvin's Pet Peeve Classic comic strips from 1992 on paulcarhart.com with plans to begin posting brand new original comic strips later in the year (the first new one was drawn and featured on the Creative Underground earlier in the year).